As another term comes to an end, it is time to start looking forward to the summer. Our athletes have been training hard all winter and have an open event to compete in on Tuesday. Our tennis players have been taking lots of extra lessons with Mr Surtees, with a tour to Portugal to look forward to over Easter. Our cricketers will be keen to start playing outside after all their indoor training as they set off on their pre-season tour to Sri Lanka on Friday. Thursday sees the running of our annual House Cross Country event, The Routh. I have heard so much about the run and the 800-person sprint to the first gate; I am really looking forward to it. On Friday we have our Colours and Commendations assembly in Chapel - another fantastic occasion to celebrate the successes of our teams and individual performers. After a long term of home and away matches, both of our U18 badminton teams triumphed in the local league with Oakham, Oundle and Stamford Schools, having been led superbly by captains Tingting Yu and Adrian Woo. There have been some impressive individual statistics with Sze Wong winning 32/34 games, May Zhou winning 33/36 games, Tim Tian 20/24 games and Adrian Woo 24/29 games. We took eight pupils to the Independent Schools’ Climbing Competition in Swindon, Wiltshire on Wednesday. We had two teams, of four boys and four girls, and we were all astonished at the high standard of both the routes and the other climbers. This was very much a first for us and we didn’t know what to expect, but we had an exciting day. In the end the boys’ team came 23rd and the girls’ team came 28th (out of 31 teams in total). We’ll be back next year! 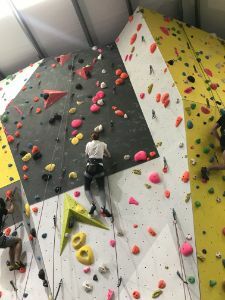 Many congratulations to our climbing pioneers Phoebe Hunter, Niamh Kelly, Isabella Lewis, Natasha Lewis, Thomas Green, George Ng, Tom Bonaert and Ben Larrett. The conclusion of the Northamptonshire, Leicestershire & Rutland Target Shooting Association Junior Championship last week resulted in Ross Carmichael winning the title for the second year and picking up an antique silver SMRC Spoon; Abigail Howe was placed third overall and Rupert Spall fifth. Our 1st VII continued their preparations for this week’s Rosslyn Park Sevens with an impressive display at the Wisbech U18 Tournament. They were victorious against St Christopher’s, Oundle and Bedford Schools, before losing out to the hosts in their final game. I travelled to The Perse School, Cambridge on Thursday to watch both our 1st XI and U16As compete in the National Plate Hockey. The Perse played superbly in the U16 game and were too strong for us on the day. The 1st XI match was a humdinger with both sides dominating play at various times during the game. After going one goal down in the first half, we fought back to lead 2-1 before two lapses in concentration allowed The Perse back into the game with two soft goals. We created a number of chances in the last ten minutes but could not quite get the ball over the line to force extra time. On Saturday we took on Repton in our final block fixture of the season. The highlight was a 1-1 draw in the 2nd XI fixture after we equalised with just minutes to go in a very high standard game - a phenomenal effort from our boys, according to Mr Shacklady. Our 3rd XI lost 1-2 in a belter, with some great play from William Beharrell and Charlie Fairs. Our U15As also had a really good game to end their season, leading twice before missing out on victory by two goals to three. Our U14As played some brilliant hockey against one of the best teams in the country and their attitude was superb. Our U14Bs lost 3-5 after fighting back from a poor start in the first half and our U14Cs wrapped up their season with an impressive 2-1 victory. Our tennis team had their first outing of the year at Leicester Grammar School on Thursday. With a number of younger boys playing, the future looks very bright for Uppingham tennis – our new Head of Tennis, Mr Surtees, has seen over 100 pupils play this term! We had some fantastic games against Oundle School on The Middle on Saturday afternoon. Our 1st XI boys moved the ball well but went one goal down after an excellent strike from outside the box and could not quite claw their way back into the game. Our 2nd XI boys fought out a 1-1 draw that was more exciting than the score line suggests. Watching our 1st XI girls is always great value – they were undoubtedly the noisiest team playing on Saturday. Their game also finished 0-0 when the two teams got together and decided they would like to have a penalty shoot-out just for fun! The highlight of the day was undoubtedly the U16A boys’ magnificent comeback. After conceding a goal in the first few seconds we were 0-2 down at half time before an inspired second half display including a brace apiece from Theodoro Smith and Michael Wong gave us a famous 4-2 victory. Our netballers finished their season with a block fixture against Oakham. Oakham’s senior teams were on impressive form, challenging our girls to up their game. Our U16As enjoyed a superb game at home with Matilda Luscombe motivating the team at the end of each quarter. After a poor first quarter our girls fought back but could not quite close the gap and missed out on victory by two goals. Our U16Bs were equally impressive in losing by just three goals – these are the type of close competitive games we want to be playing every week. Our U15s finished with their best display of the season with our U15As playing out of their skin, our U15Bs completing an undefeated season (Anna Lowry, Olivia Henson and Zoe Pyott have been brilliant in scoring goals, Sonia Pérez Pera, Jasmine Curran, Emily Dutton and Eloise Stonebridge have been the ‘go to’ players through the middle, with Beatrice Fisher and Molly Williams solid in defence each week) and our U15Cs continuing to improve, with a number of girls playing netball for the first time this year. Our U14As came up against a superb Oakham team who played brilliantly (hopefully our girls will have learned a lot from the experience) and our U14Bs team moved the ball well and scored some lovely goals. Our U14Ds, U14Es and U14Fs continued to impress with three excellent performances displaying the strength in depth we have in this year group – yet again every girl represented the school.